Surface magazine announces the 12th Annual Avant Guardian Project. For more than a decade, Surface Magazine has passionately supported emerging talents in art, architecture, design and fashion, exposing the forefront of our visual culture. Originally conceived twelve years ago as a tool to seek out and celebrate budding stars in commercial photography, Surface's Avant Guardian Project serves as an unprecedented promotional outlet for American photographers. Now celebrating its 12th year, the Avant Guardian provides emerging photographic talents with the opportunity to bring their visions to life, pooling the resources of their network of studios, stylists and fashion clients to help these burgeoning photographers craft fashion editorials and gain global recognition. Surface editors and a guest panel of internationally renowned industry experts select a handful of the most promising and distinctive talents from thousands of submissions. 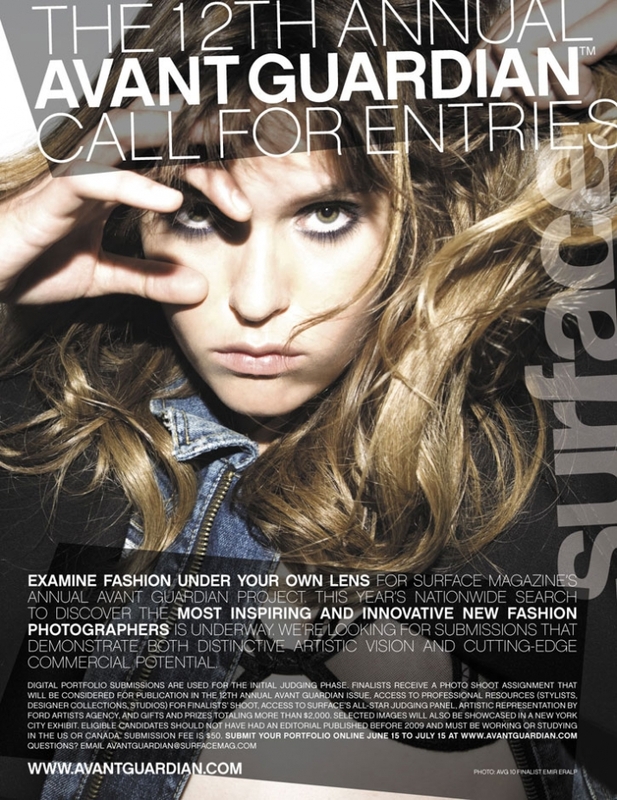 Winners of the competition have their work featured in a blowout fashion spread – The Avant Guardian Portfolio, in Surface’s popular November Avant Guardian issue. The issue, along with the Avant Guardian Project’s most visually arresting images are celebrated and showcased in a compelling gallery-like installation at our New York City gala. Submissions will be accepted from June 15 - July 15 2009 at AVANT GUARDIAN PROJECT. For more information email [email protected]. Past AVG’s have included more than 120 top photographers including, KT Autela, Clang, and Vanina. Past AVG’s have gone on to be represented by top agents from Art+Commerce to Art Partners and shoot for French, American and Italian Vogue, Harpers Bazaar, The New York Times Magazine and more. The Avant Guardian Project continues to emulate the successful balance that Surface has struck between conceptual artistry and commercial marketability. With another decade in its sights, Surface will continue to locate and give voice to the most creative American fashion photographers. For 15 years, readers have turned to Surface for creative inspiration, coverage of the burgeoning design world, and profiles of the emerging designers and provocative projects that are reshaping the creative landscape. With this ability to identify and collaborate with undiscovered talent—from furniture makers to fashion designers—the magazine acts as a cultural barometer of global style in all its forms. With an international team headquartered in New York, the magazine is constantly expanding its ability to identify, celebrate and support the artists and ideas that connect the present with the future. 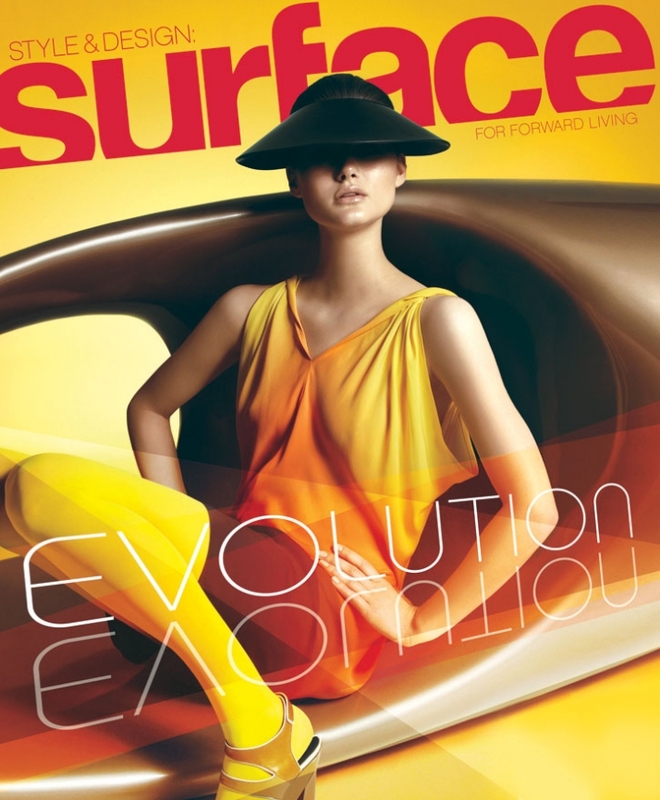 Surface is the definitive American source for engaging, curated content covering all that is inventive and compelling in the design world. Surface is published six times a year and is owned by Quadra Media, LLC.